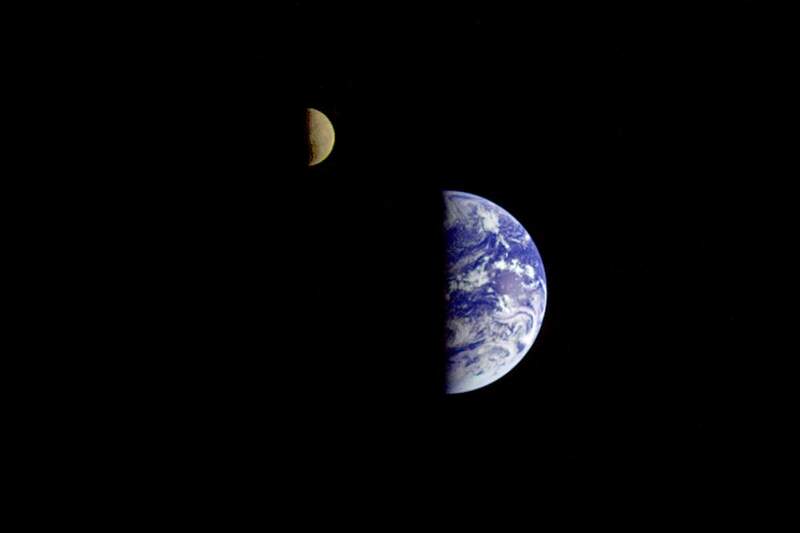 A 1992 family portrait of Earth and Moon from the Galileo spacecraft. This is a resized and cropped image. You can see the original image on the NASA website. Galileo was an American unmanned spacecraft that studied the planet Jupiter and its moons, as well as several other Solar System bodies. Named after the Italian astronomer, physicist, engineer, and polymath Galileo Galilei, it consisted of an orbiter and an entry probe. Galileo spacecraft was delivered into Earth orbit on October 18, 1989, by Space Shuttle Atlantis. It flew by Venus on February 10, 1990, at a range of 16,106 km (10,008 mi). Its flight past Venus in 1990 yielded fascinating infrared images of the planet’s clouds. Having gained 8,030 km/h (4,990 mph) in speed, the spacecraft flew by Earth twice. The first Earth flyby was at a range of 960 km (600 mi) on December 8, 1990. Two years later, it performed a second flyby of Earth at 303.1 km (188.3 mi) on December 8, 1992, adding 13,320 km/h (8,280 mph) to its cumulative speed. Eight day after this second flyby, on December 16, it looked back and captured this family portrait of Earth and the moon above. Between these two Earth flybys, on October 29, 1991, Galileo spacecraft approached the S-type asteroid Notes 1 951 Gaspra to a distance of 1,604 km (997 mi), becoming the first spacecraft performing an asteroid flyby. On August 28, 1993, Galileo performed close observations of a second asteroid, 243 Ida, at a range of 2,410 km (1,500 mi). The spacecraft discovered Ida has a moon, Dactyl, the first discovery of a natural satellite orbiting an asteroid. Artist’s concept of Galileo at Io with Jupiter in the background; the high-gain antenna is fully deployed. Image: NASA Named after the Italian astronomer, physicist, engineer, philosopher, and mathematician Galileo Galilei (15 February 1564 – 8 January 1642), The spacecraft named after Galileo Galilei, because the four largest moons of Jupiter (Io, Europa, Ganymede, and Callisto) were first seen by the Italian astronomer in January 1610, and recognized by him as satellites of Jupiter in March 1610. These four moons are now named “Galilean moons”. After gravitational assist flybys of Venus and Earth, Galileo arrived at Jupiter on December 7, 1995, and became the first spacecraft to orbit Jupiter. To eliminate the possibility of contaminating local moons with terrestrial bacteria, on September 21, 2003, after 14 years in space and 8 years in the Jovian system, and after a lot of discoveries, Galileo’s mission was terminated by sending it into Jupiter’s atmosphere at a speed of over 48 kilometers per second (30 miles per second). Galileo also observed the first extraterrestrial collision of Solar System objects that humanity has witnessed: Comet Shoemaker-Levy 9’s collision with Jupiter in July 1994. In 1994, Galileo was perfectly positioned to watch the fragments of Comet Shoemaker-Levy 9 crash into Jupiter, whereas terrestrial telescopes had to wait to see the impact sites as they rotated into view. On October 11, 1995, as the spacecraft was approaching Jupiter, the mission controllers commanded the Solid-State Imager to record an image of the planet and store it on the DMS. At the conclusion of this activity, the tape recorder was to be rewound and the data played back onto the downlink. When commanded, the DMS began to rewind but failed to stop at the end of the tape. All indications were that the DMS was broken and would not be available for orbital operations. The project team immediately began an intensive effort to determine the actual state of the DMS, while initiating a concurrent activity to redesign the LGA orbital-operations software to work without this critical equipment. After two weeks of effort, the flight engineers were able to determine that the DMS was not broken, but that the tape itself had stuck to the erase head and did not rewind. The tape capstan was turning without tape movement, resulting in burnishing a spot on the tape. Subsequent efforts moved the tape forward, and the team decided it was prudent not to run the tape across the damaged area ever again. The burnished area was buried under several wraps of tape on the reel. The Phase 2 flight software was modified to use the tape recorder in a new way, using recorded markers to indicate the end of tape (rather than the tape markers), ensuring the damaged area would remain buried. 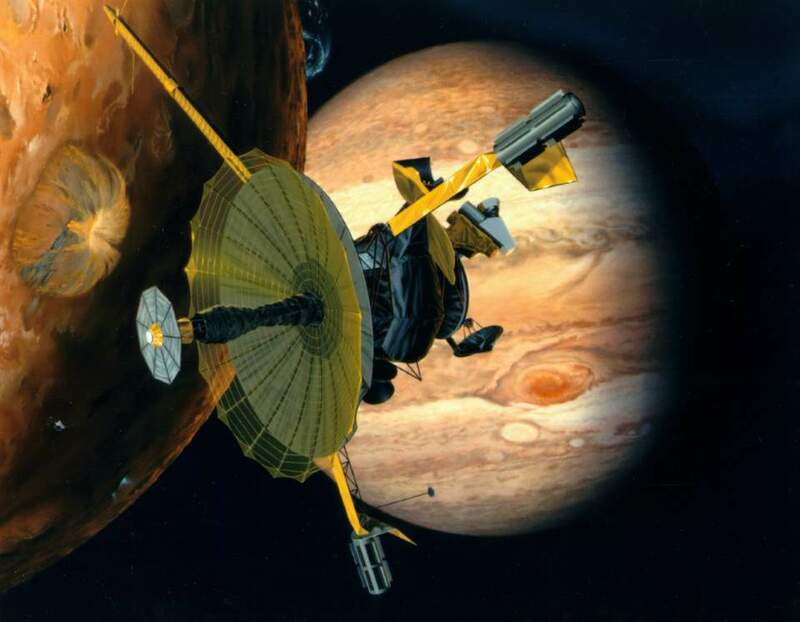 After releasing its atmospheric probe on July 13, 1995, the Galileo orbiter became the first man-made satellite of Jupiter on December 8, 1995, after it fired its main engine to enter a 198-day parking orbit. Galileo’s prime mission was a two-year study of the Jovian system. The spacecraft traveled around Jupiter in elongated ellipses, each orbit lasting about two months. The differing distances from Jupiter afforded by these orbits allowed Galileo to sample different parts of the planet’s extensive magnetosphere. The orbits were designed for close-up flybys of Jupiter’s largest moons. Once the prime mission concluded, an extended mission started on December 7, 1997; the spacecraft made several flybys of Europa and Io. The closest approach was 180 km (110 mi) on October 15, 2001. The radiation environment near Io was very unhealthy for Galileo’s systems, and so these flybys were saved for the extended mission when loss of the spacecraft would be more acceptable. Galileo’s cameras were deactivated on January 17, 2002, after they had sustained irreparable radiation damage. NASA engineers were able to recover the damaged tape recorder electronics, and Galileo continued to return scientific data until it was deorbited in 2003, performing one last scientific experiment: a measurement of the moon Amalthea’s mass as the spacecraft swung by it. S-type asteroids are asteroids with a spectral type that is indicative of a siliceous (i.e. stony) mineralogical composition, hence the name. Approximately 17% of asteroids are of this type, making it the second most common after the carbonaceous C-type.